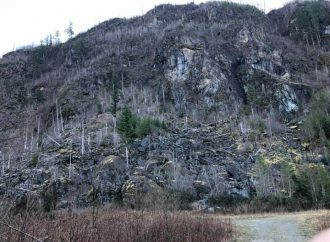 The publicly accessible collection of letters and comments submitted to Skagit County in response to an application by Kiewit Infrastructure Company of Vancouver, WA, to develop and operate a large quarry mine near Marblemount includes a highly sophisticated and well-reasoned letter submitted by a competitor of Kiewit. The thrust of the letter is that Kiewit’s applications are prohibited by the Skagit County Code and must be denied or suspended. Here is the text of the letter for your review and information. Kiewit Infrastructure Co.’s (“Kiewit”) applications for a special use permit and associated authorizations from Skagit County to expand a less than 3-acre quarry supplying materials to thelocal community into a 640-acre mine site supplying jetty stone (aka armor stone) along the west coast of North America are expressly prohibited by Skagit County zoning, such that Kiewit’s application should either be (i) denied, or (ii) suspended so that Skagit County can properly first consider amending its Comprehensive Plan to expand its mineral resource overlay (“MRO”) to cover all of the areas for which Kiewit is now seeking permits, including Kiewit’s proposed mine access road. (If Kiewit modifies its proposed project to be confined entirely within the existing MRO, that necessarily would constitute a substantial project revision under the Skagit County Code (“SCC”) and the application process should be restarted and/or the public given an opportunity to comment on such substantially revised project.) In addition, Kiewit’s application materials are, at best, misleading, and Skagit County should require that Kiewit provide additional information pursuant to SCC 14.06.100(5), after which the public should have an opportunity to comment with Kiewit’s actual plans in mind. Notwithstanding the minimal “mitigation” proposed by Kiewit, it is clear that Kiewit’s proposed project “may have a probable significant adverse environmental impact,” such that an environmental impact statement must be prepared under Washington’s State Environmental Policy Act. 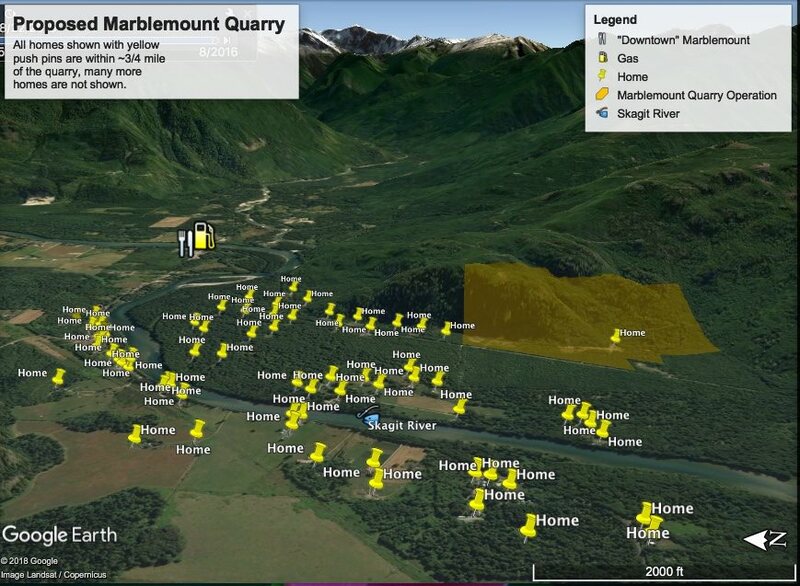 According to Kiewit’s application materials, “the Marblemount Quarry as one of the very few sources of ready-to-permit jetty rock on the west coast.” This is simply not true. 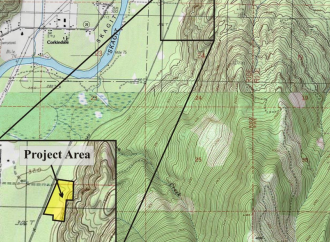 First, this site is not “ready-to-permit,” as it is not even fully zoned for mining. Second, the U.S. Army Corps of Engineers’ Revised Final Environmental Assessment, Rehabilitation of the Jetty System at the Mouth of the Columbia River (June 2012) identified 15 quarries as potential sources of jetty stone. In the seven years since the Corps’ 2012 assessment, additional quarries fully capable of supplying jetty stone for that project have been permitted and opened. The Corps’ forthcoming jetty work at the mouth of the Columbia River is anticipated to require at least 500,000 tons of armor stone. Assuming Kiewit is able to produce its desired 4 to 28-ton armor stone at a 20% rate (i.e., 20% of the rock removed from the mine constitutes armor stone), which would reflect the best industry averages, Kiewit would need to mine 2,500,000 tons (or one million cubic yards at a 1:2.5 cubic yard to ton ratio) for that one project alone. Kiewit’s application estimates that Step 2 would produce about 3.8 million cubic yards. Kiewit would mine that material in rapid progression. What would happen to the 80% of the rock that is not armor stone? For Step 2, Kiewit would deposit at least 3,040,000 cubic yards (i.e., at least 80% of 3.8 million cubic yards) on a 13-acre “undersized rock stockpile area.” There are 62,920 square yards in 13 acres. Accordingly, to accommodate 3,040,000 cubic yards of rock, Kiewit would need to create roughly 50-yard high stockpiles or, more accurately, tailings. Cunningham Crushing could then screen and crush Kiewit’s tailings to supply the local community. Kiewit notes that Cunningham Crushing’s operations “will be completely dependent upon local market conditions.” As Cunningham Crushing’s operations over the prior almost 40 years have only mined “under 3 acres,” it is clear that Kiewit’s tailings will remain on site for decades to come. And this is without even accounting for Kiewit’s desired Step 3, which would result in the tailings expanding to cover another 15 acres. All told, Kiewit’s project would result in at least 7.68 million cubic yards (i.e., 80% of 9.6 million cubic yards) of tailings on site. In addition, Kiewit proposes, among other things, to clear-cut 90 acres of timber (2.7 million board feet), cut-and-fill almost 1,000,000 cubic yards to build a mine access road (outside the existing MRO), divert active stream flows that the Washington State Department of Natural Resources has determined are fish-bearing, and conduct extensive drilling and blasting using a mixture of ammonium nitrate and diesel fuel (ANFO). The ANFO load to ground water will exceed 5,000 tons of residuals. Kiewit’s project will contribute to extensive habitat loss of both flora and fauna and could result in ground and surface water impacts. The analysis Kiewit has provided concerning environmental impacts, and the minimal mitigation proposed by Kiewit, is deficient and conflicts with determinations made by state agencies. Skagit County should exercise its authority under SCC 14.06.100(5) to require Kiewit provide additional information or studies to address these matters, which also necessitate the preparation of an environmental impact statement. 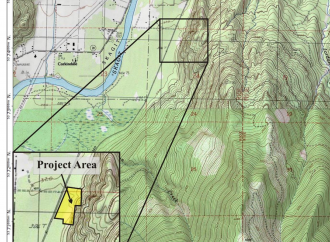 The six properties subject to Kiewit’s application are within Skagit County’s Industrial Forest- Natural Resources Lands (IF-NRL), Secondary Forest-Natural Resource Lands (SF-NRL), and Rural Resource-Natural Resource Lands (RRc-NRL) zones. In each of those, commercial mining activities can only be approved (and the hearing offer only has authority to consider commercial mining applications) “within a designed mineral resource overlay.” SCC 14.16.410(5)(d), 14.16.420(4)(d), 14.16.430(4)(g). However, Kiewit’s application includes mining and mining related activities in areas outside the existing MRO. Consequently, Kiewit’s application simply cannot be approved. See SCC 14.16.020(3) (only uses listed within a par?cular zone shall be allowed). planning and is prohibited by the SCC. Moreover, even Kiewit’s Step 1 and 2 activities are not entirely within the existing MRO. 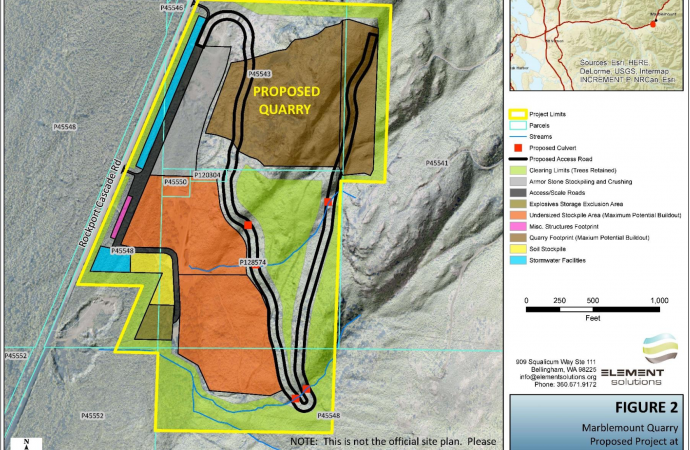 For example, as part of Step 1 and to facilitate mining in Step 2, Kiewit proposes to construct “an approximately 6,700-foot gravel access road would be built to access the top and eastern portions of the project site.” This mining access road would be built in areas outside the existing MRO. See, e.g., application at page 3 (the expanded MRO would include the then “existing [mine access] road”). However, “activities associated with mining or quarrying operations,” such as mining access road building and maintenance, can only occur “in the Mineral ResourceOverlay.” SCC 14.16.440(7)(b). 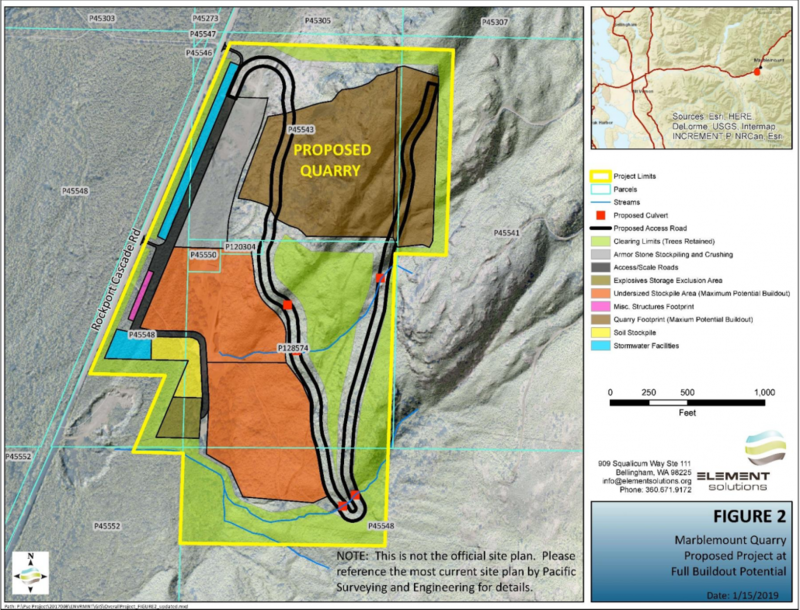 As the mining access road to be built and used for Steps 1 and 2 is outside the current MRO, Kiewit’s Steps 1 and 2 activities cannot be permitted as proposed. 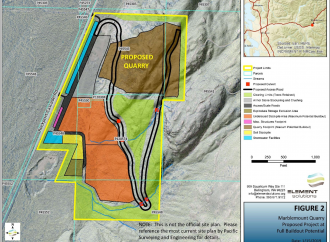 In summary, Kiewit’s applications pending before Skagit County are prohibited by the SCC and must be denied or suspended until the Comprehensive Plan is amended to expand the MRO to include the entire area in which Kiewit has proposed to conduct mining activities. Note: All comments on this site are subject to review and approval before posting.